8 x 10 gelatin silver print taken by James Burton on Long Island Sound, 1899. Printed by Rosenfeld and Sons, date unknown. Port beam view of the cutter COLUMBIA under sail. Vessel seen on a starboard tack. COLUMBIA was a U.S. America's Cup defender in 1899 and again in 1901. 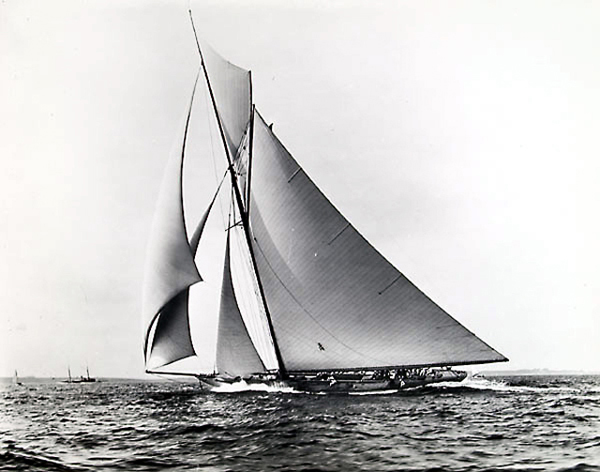 She was designed by N. G. Herreshoff and built at Herreshoff Manufacturing Co., in Bristol, RI 1899. Stamped on back: "NOTICE: This Photograph is sold with the following understanding that it is for YOUR USE ONLY and not to be SYNDICATED or LOANED and that the following CREDIT LINE must be reproduced. Photo MORRIS ROSENFELD, N.Y.". Handwritten on back: "Columbia 1899". Embossed in lower right corner: "MORRIS ROSENFELD N.Y."